Tweenagers may think Stephenie Meyer invented the vampire in her best-selling Twilight series. Certainly Robert Pattinson brings the character up to heart-throbbish date in the mega-popular film adaptations. But the vampire has been with us for way longer, even further back than 1922’s creepy Nosferatu. 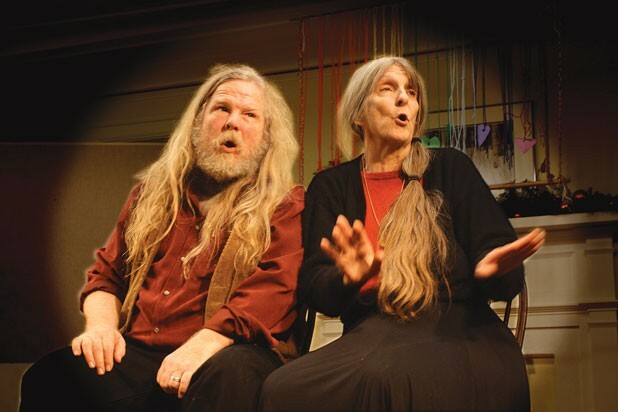 This week, over four performances as part of Lost Nation Theater’s Winterfest in Montpelier, Vermont storytellers extraordinaire Tim Jennings and Leanne Ponder will premiere “The Vampire Princess” — not to be confused with yet another movie of the same name. This version is an old Bohemian folktale, Jennings says, collected a couple of centuries ago and likely passed along for generations before that. Its full name is “The Gypsy Soldier and the Vampire Princess,” and it should be noted that the story might be inappropriate for very young children. In it, a king’s daughter, who happens to be a vampire, sleeps in a coffin by day and awakes at night expecting a meal — of human blood, of course. The king, who will do anything for his girl, obliges by sacrificing, one by one, some of his loyal soldiers. But one of them, a resourceful gypsy, manages to find a way not to be killed when his turn comes. And thereon hangs a tale. A 25-year veteran performer of folktales and music, Jennings says it still takes him two years of fine-tuning a story before he “stops sweating,” though his ease onstage never betrays any insecurity. When he and Ponder have tried out “The Vampire Princess” before small audiences, people have “just really liked it,” he says. He and Ponder, who have been a couple for 27 years and a storytelling team for 24, have themselves developed a flow: They tell a story like a verbal pas de deux, each taking different parts, delivered in myriad voices. Jennings’ natural voice is a booming baritone, but that doesn’t mean he can’t sound like a tiny creature. Ponder’s range is impressive, too, from little girl to scritchy crone to stentorian man. The pair’s utter absorption in these roles is a delight to watch; their timing and interplay may seem to come naturally, but their animated performance is thoroughly rehearsed, as well. The couple’s act and recordings — with musical interludes of his concertina and her harp — have won many accolades; for example, their 2010 CD The King and the Thrush was named a Notable Children’s Recording by the American Library Association. But folktales are not just kids’ stuff; Jennings and Ponder know that we humans seem to be hardwired to listen to stories. Most of their fare has all-ages — that is to say, ageless — appeal. Perhaps that’s why millennia-old stories still resonate. The Twilight saga is yet another instance, albeit sexed up and CGI’d for the 21st century. The “Princess Vampire” tale and several others will be on Jennings and Ponder’s next CD, which they’ll record “sometime this summer,” he says. Then they’ll tour the state with it through the fall. In Montpelier this Valentine’s week, the couple will tell the headlining story and a few shorter ones — both eerie and romantic. For the show’s second half, he and Ponder will invite the audience to choose between two classic world tales. Rest assured, in this case, neither choice is wrong. The print version of this article was headlined "Vermont's Storytelling Couple Premieres and Age-Old Vampire Tale".